While digging in the Menominee Reservation in Wisconsin in 2008, archeologists discovered a small clay pot which was nearly 800 years old. 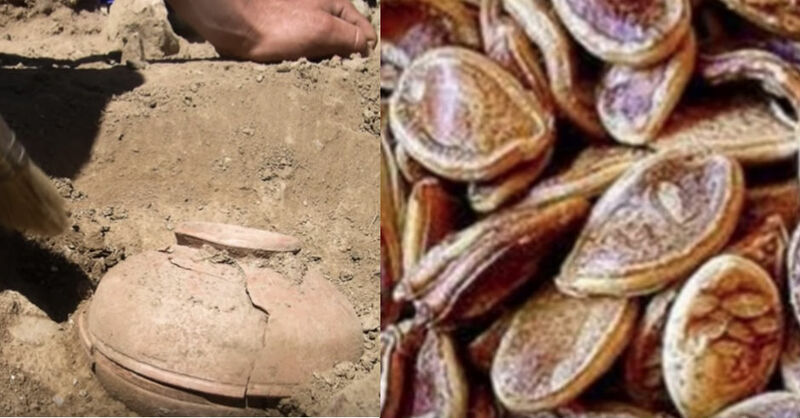 The pot is a pretty amazing discovery in itself, but archeologists found something inside that would influence the way we understand the history of food preservation and storage. It also reminds us that those who roamed this country before us have had a profound influence on our planet. Inside the pot, the archeologists who dug it up found a handful of seeds. They believe that the seeds had been buried in the pot as a way to store them and keep them fresh. Archeologists later found out that the seeds came from an extinct species of squash. Seven years after the tiny bowl and its contents were found, students in Winnipeg planted 800 year old seeds and surprisingly they started to grow only shortly after they were planted. The type of squash is called Gete-okosomin, which translates to Big Old Squash in the Menominee language. The squash species is currently being cultivated in order to prevent it from going extinct again. Whoever buried this pot there may not have known it at the time, but they were acting to save a species that would have otherwise been lost to history. of squash is called Gete-okosomin, which translates to Big Old Squash in the Menominee language.